Last week we took a look at Med Hand's Oxford Handbook of Clinical Medicine iPhone app. This week I'll do a brief run through of another favourite text, Harrison's Manual of Medicine and how the iPhone convert fits into the healthcare environment. Finally there is a short video demonstrating the user interface, content and some of the functionality of both apps. There are several apps on the market which hope to bring the classic text to the iPhone (Unbound Medicine, Skyscape, and MedHand.). The biggest advantage that Med Hand's app offers over its' competitors is that, it is sold at a flat fee, and an internet connection is not required to access the content. The user interface of the app is similar to the Oxford Handbook of Clinical Medicine app and allows information to be found relatively easily. Improvements could still be made to make the process more seamless. 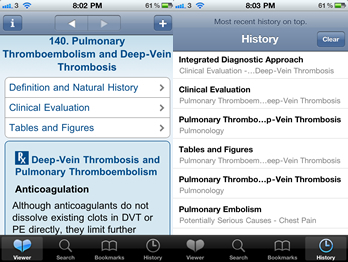 A major downside to this app is that, it is not the full version as per the textbook or as seen on Access Medicine. Much like a pocket version of many textbooks this app is an abridged version of the full text. Despite this, the app still has a large bank of information, with topics ranging from Cardiology and Infectious Diseases, through to a section on Lab Values. The video below illustrates the Oxford Handbook of Clinical Medicine and Harrison's Manual of Medicine apps in action.